The combined creativity of award winning folk duo Tim Edey and Brendan Power will hit Irish shores this month as they bring their multi – instrumental talent to established music venues around Ireland. Edey and Power were the recipients of the BBC Radio 2 Folk Award for Best Duo in 2012 and Edey also received the accolade of Best Musician in the same year. This success derived from the release of their award winning debut Wriggle and Writhe and more recently the pair has showcased their inspired spark of musical improvisation with the launch of their Live in Canterbury DVD. 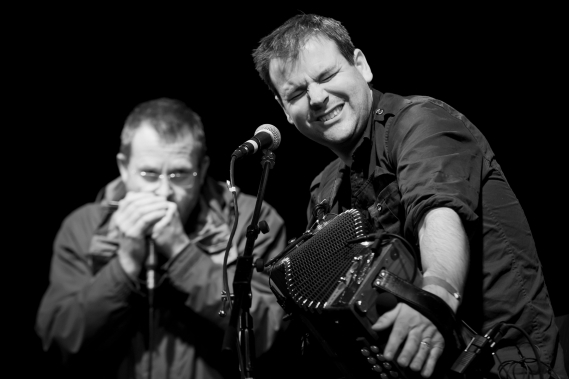 UK based Kiwi harmonica player and composer Brendan Power is acknowledged by many as one of the most versatile and creative harp players around today. As well as being recognised for his creativity in Irish music he is also firmly established as a jazz and blues style player and was voted International Harmonica Player of the Year 2011. He has recorded with the iconic artists Kate Bush, Sting and Van Morrison amongst others. Edey has emulated this success with guitar and button accordion. He has recorded and toured with legendary folk icons Christy Moore, Sharon Shannon and The Chieftains. He has released four solo albums and his original compositions have been recorded by established artists throughout the music Industry. His technical mastery combined with his fresh approach to music has established him as a stalwart of the Irish folk scene. 23rd The Gathering Festival, Killarney. ← RESEARCH – How easy is it?